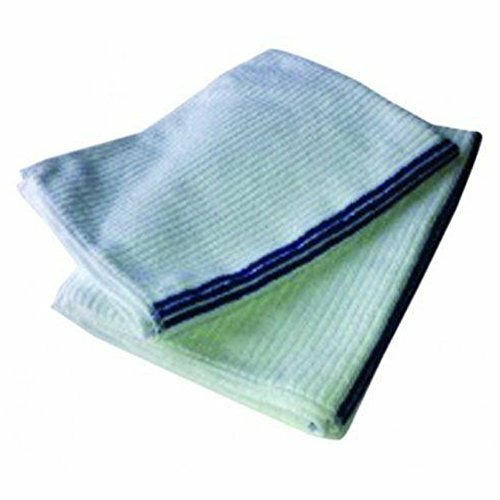 Our Kitchen Basics ribbed Microfiber bar mops Microfiber wholesale's 14”x17” Microfiber bar towels is a more effective longer lasting alternative to traditional cotton bar towels. These lint free Terry Type Microfiber towels are made up of hundreds of thousands of split fibers which allow the cloths to absorb a tremendous amount of liquid without leaving streaks behind. Also known as Microfiber bar mops, these towels are constructed from woven polyester/polyamide blend Microfiber. The open spaces in the fibers created by the splitting process are what give the towels its ability to hold dust and dirt as well as its ability to absorb liquid. The edges of the towels are sewn with over lock stitching which greatly increases the life of the towel. The towels also feature the traditional gold stripe of a bar mop which helps identify where to use them. When cared for properly, these bar towels can last hundreds of washings, Compare that with traditional cotton bar towels which may be unusable after 20-30 washings.